In a world of global competition and escalating qualifications, learning an extra language is an advantage and gives added value to one’s resume. Learning a new foreign language such as Chinese, English or Japanese is easy with the advance of technology. A useful gadget manufactured by Seoul-based MT Systems Co Ltd can be used to pronounce words or characters simply by pointing the pen-like reader to the printed image. Known as the Tonto PA-200, the device produces a clear reading voice which sounds very humanlike at an excellent speed of up to 128Kbps. The reader can pronounce and read in ten different languages. The best news is it reads books that have been embedded with a special invisible film invented by MT System. Thus, existing reading materials can be easily converted to become compatible with Tonto PA-200. New languages can be programmed into the device by transferring the necessary information from a PC via a USB port. The gadget comes with a built-in memory of 256 MB as well as a removable NAND Flash memory cartridge for audio files. It runs on electricity or two AA batteries. In situations where one has to visit a foreign country for business or pleasure and has no time to learn the basics of a language, the gadget can come in handy. By simply pointing to words or phrases, one can ‘converse’ with the locals. For the basic price of $120, this electronic gadget makes a great Christmas gift for young children, travelling adults or retired people who want to learn new languages. 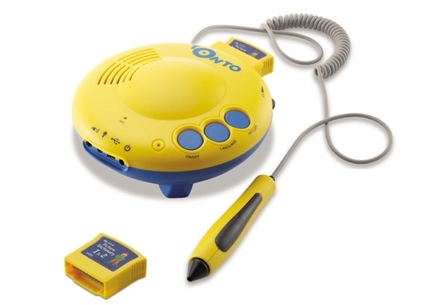 It is a great bargain for an educational toy or studying aid.